The cover of this CD makes it seem like an unassuming little project: 12 Irish songs on acoustic guitar and fiddle, without any other musicians pitching in. 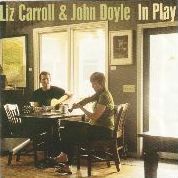 But Liz Carroll and John Doyle don’t seem to need any outside help to make a great album. If you like instrumental music at all, “In Play" (Compass Records) will rate permanently as one of the best in your collection. In the hands of this duo, Irish tradit has a long, long way to go before it sleeps. It’s quite a distance from the local pubs where these tunes were born to the smooth, complex renditions from players like this. But the line isn’t quite broken, and that’s what so great about “In Play." At times, this CD sounds vaguely like English, Latin and even Baroque harpsichord music. But the net result is always Irish. Carroll and Doyle, who’ve been playing concerts together for some time now, are two rare artists who never seem trapped in the Irish genre. They keep finding new twists and colorations that keep “traditional" sounding like something you’ve never really heard before. John Doyle is a favorite player of mine (Read Interview with John Doyle), but it’s great to hear Liz Carroll stretch out across her full range here. “The Box Man" jig is so lively you may get a speeding ticket if you play it in your car, while a slow, Cape Breton-flavored air called “The Island of Woods" is one of the most lovely, mournful things imaginable. Other songs like “Hunter’s Moon" and “The Long Night On The Misty Moor" have her working in a more exploratory, modern territory. I’ve always known of Liz Carroll, but this collection makes it clear why she’s at the top of Celtic music. Carroll and Doyle are on tour across the US right now. My advice: get off your Irish-American duff and check them out ASAP.